EUYCamp in Latvia had participants from Latvia, Estonia, Lithuania, Russia and Sweden with a Head Coach from Poland. 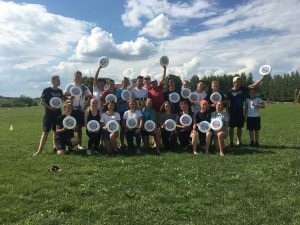 There were all levels of ultimate from complete beginners to more experienced players, but most of youth players were playing ultimate from 6 month till 2.5-3 years. All youth players were living on site that gave opportunity to not only communicate during practice sessions but also after them, exchanging their cultures and having fun together. Taking into account different playing levels, the ultimate program of the camp was adjusted to cover from the basics but still having interesting technical aspects and challenges for more experienced players. Theoretical part of the camp was done interactively with quiz about the rules where participants tried to answer the questions and then we discussed which rules apply, as well as history of ultimate and detailed explanation of Spirit of the Game with examples. Practice sessions were aimed to improve skills with the discs, see and use the space of the field, understand how to move effectively and of course play! There were several games in different formats, but also opportunity to play against “coaches” team. In the evenings there were social activities, including playing DDC (most of youth player got to know this game only in the camp), basketball, watching football World Cup, visiting adventure park and even adhoc Trading Night! It was definitely very useful event in sense of encouraging youth players develop their skills and stay in ultimate sport! The rest youth players were paying for the camp themselves.